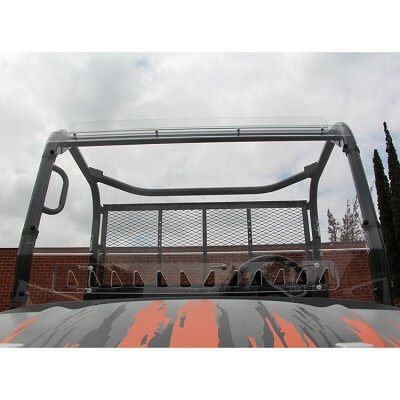 View cart “Kubota RTV500 Full Cab Enclosure with Soft Windshield” has been added to your cart. This windshield comes with a sliding vent system which allows for airflow. These windshields are Quantum Hardcoated; meaning that they are 30x more scratch resistant than acrylic, and 10x more scratch resistant than MR10 Coated Lexan. The Quantum Hardcoating also gives much higher optical definition and clarity. This is coated with the toughest hardcoating that there is. Windshield comes with all Hardware and instructions for installation. Installation time approximately 15 minutes. Made with pride in the USA.